SecuriWORLD is Canada’s premiere Security Services Company, with full licensing and insurance to ensure that you and your assets are protected in the most effective way possible. Our organization is your number one choice, whether your needs entail human surveillance, electronic systems, or a combination of the two. We offer the widest variety of services and Security Personnel, including Bodyguard, Riot Protection, Employee-Termination Officers, Move-Out Supervision Officers, Concierge Officers, Front-Desk Clerks and much more. Our friendly and helpful Security Specialists will help you to determine what is the best option for you, including free, no-obligation site inspections scheduled at your convenience. SecuriWORLD specializes in fulfilling short-notice, same-day service requests. When time is of the essence, please do not hesitate to give us a call. Our Security Specialists can dispatch a Guard to new sites in less than 30 minutes and provide you with up to 24 HR continuous coverage for as long as you require. SecuriWORLD offers you the best of both worlds, including high-quality Security Services at the most affordable rates, with no obligation to continue. That’s how confident we are that we will surpass your security expectations. We are also happy to assist you with temporary, non-standard, and on-call service requests including construction and renovation projects with non-determinable end times. We completely relate to you and for this reason, we ensure that discontinuing your temporary Site Security Services is just as fast and easy as setting it up. 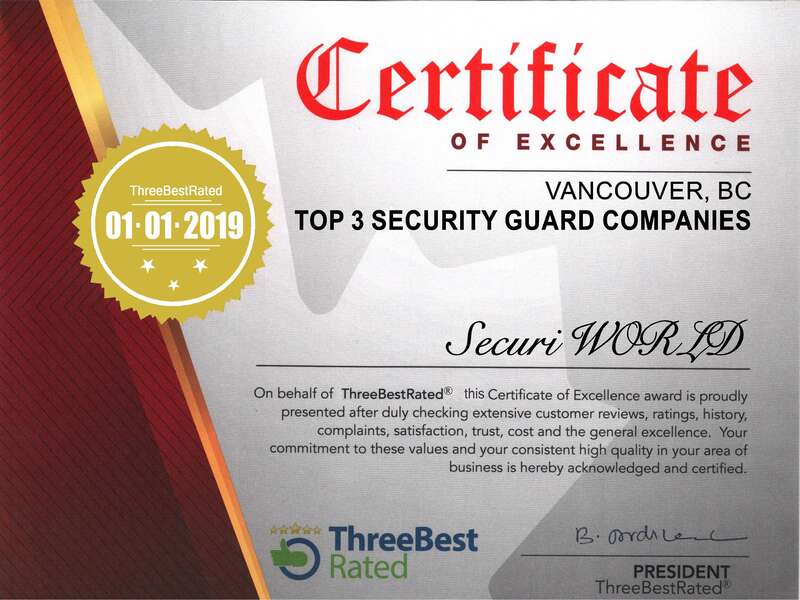 Simply call our office at 604-282-3437 ext: 1 or e-mail us at info@securiworld.ca any time of day or night with your request, and our support staff will discontinue services penalty free, with a maximum of only 2 HRS additional service charge if the Guard is already dispatched to your site. SecuriWORLD is the only Security Company in Canada with this type of non-penalty policy in place. We hope that it serves you as an indication of our dedication to excellent customers service. Whether your needs include Security Guards, Cameras, and Alarms, or a unique, non-standard service tailored to your requirements, SecuriWORLD is the #1 leader in progressive Security Services. Request a free quote today and allow SecuriWORLD to give you the freedom you need to move forward. SecuriWORLD Canada is a fully licensed and insured security company and we are proud to call the beautiful Province of British Bolumbia our home. At SecuriWORLD, our objective is to provide the best quality service whether we are providing security guards or electronic security systems. Our security professionals are highly trained to serve your interests and needs, while displaying unmatched work ethic, reliability and excellent communication skills. Our hiring process is meticulously designed and highly selective to exceed your expectations and ensure our promise of an unmatched quality. Our hiring is usually followed by an in-house training to equip our staff with best practices and develop their knowledge and skills. Our goal is a healthy and safe community for you, us, our children, and more generations to come. We belong to this community and thus succeeding in our mission is more than just business to us. It is something that we strongly believe in and strive for. Our team commands several years of operational and management experience in the private security industry. The combination of our experience and our innovative approach to security services is the driving force behind the continuous growth of SecuriWORLD and the guarantor of the quality of our services.